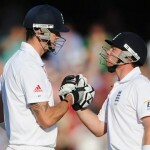 England 5-199 (Kevin Pietersen 73, Jonathan Trott 44, Ishant Sharma 2-32) vs. India. The Indian bowlers proved their worth by restricting the visiting England team to a sizeable score with half of their side back in the pavilion on day one. England scored a hard fought 199 runs in 97 overs for the loss of 5 wickets in the first innings. 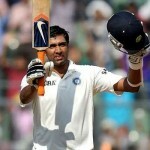 The fourth and final Test of the series commenced on Thursday, December 13, 2012, at Vidarbha Cricket Association Stadium, Jamtha, Nagpur. 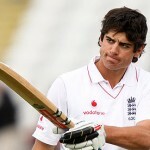 Earlier, Alastair Cook, the captain of England, won the toss and elected to bat for taking an advantage in the match. The decision bounced back when they lost their openers in quick succession for 16 in 10.3 overs as the speedster, Ishant Sharma, struck twice early. Nick Compton was caught behind by the Indian skipper, MS Dhoni, for three runs and the most prolific scorer in the series, Alastari Cook, was declared leg before wicket for just one. India preferred to go in the match with just one fast bowler and four spinners in an attempt to win the final Test and square the series. 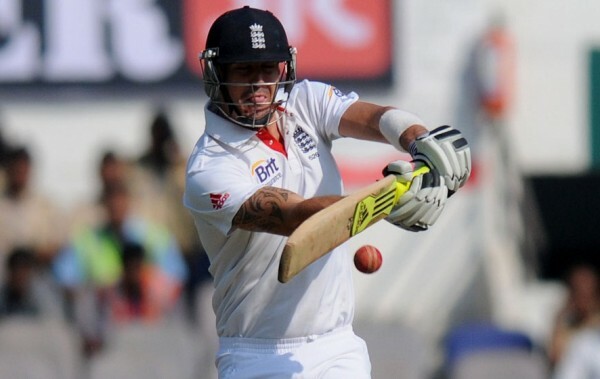 Jonathan Trott and Kevin Pietersen took over the responsibility of consolidation but found it hard to score freely. The initial 24 overs produced just 40 runs as Pietersen hit three fours in the next couple of overs and Trott preferred to secure his wicket while creeping from the other end. Kevin Pietersen achieved his 29th Test fifty on the first ball of the 44th over with a four and the first hundred of the innings was scored in the 49th over. The second wicket partnership was dislodged at 102 when Jonathan Trott was clean bowled by the left arm spinner, Ravindra Jadeja, for 44 off 133 deliveries with 7 fours. The next incoming batsman, Ian Bell, took guards at the crease as Pietersen was dropped by Cheteshwar Pujara at midwicket off Ishant Sharma at 61. The stingy form of Bell continued as he was caught by Virat Kohli at extra cover off Piyush Chawla for one mere run scored off 28 balls. The debutant youngster, Joe Root, joined in with the flowing Pietersen and the first opened his Test account with three runs. 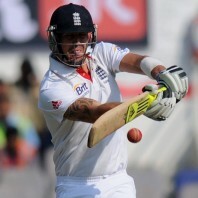 Kevin Pietersen continued with his controlled batting and finally lost his wicket for 73 off 188 with 10 fours. The fifth wicket fell at 139 in 67.3 overs and India looked like taking over the game as Matt Prior walked in the centre. The two batsmen did not take any pressure as Dhoni tried different tactics to get another wicket. He used all his five bowlers but the batsmen defended well while scoring runs slowly and the fifty of the partnership was posted on board in the 91st over. Joe Root and Matt Prior were unbeaten for 31 and 34 runs respectively as England reached 199 after 97 overs at a net run rate of 2.05. Ishant Sharma and Ravindra Jadeja were the most successful bowlers with two wickets each as Piyush Chawla held one. The batsmen at crease can bring back stability to the England innings with their dedicated batting on the second day whereas India will be looking forward to shrink the rival innings within another 50 runs.